AWESOME BRAVO SUSAN.. love this one.. when that river calls… I can relate… I lived beside a river off of Hwy 26 in Columbia SC when I was a teenager.. we loved it all of us kids. we were always at the river or Lake Murray… Now I am by the ocean.. which I am in love with.. really enjoyed your poem Susan as always. Very sweet and beautiful but simple poem about a time most of us can reflect on. I too remember time spent on Lake Okeechobee, the Tamiami Trail Canal, FL Everglades or any number of South Florida beaches. it was so wonderful, so meaningful and a delight with friends or family. Thank you for this trip down memory lane. Although the memories are clearly yours they send me on a path which leads to mine. Wonderful job. Thanks Deb and Lee. I remember now how you both told me you grew up around water as well, so you know the special meaning that even a River can hold. 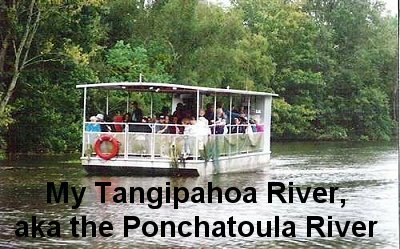 I have written at least half a dozen poems and short stories centered about the Tangipohoa River which was a part of my life for almost thirty years. And wow, Lee, I forgot you grew up around the Everglades, that must be so beautiful. I watch the Travel Show because I know there are places I would never see otherwise in this lifetime, LOL, so, at least I can see Wild Russia; the Florida Everglades; the Andes Mountains, the Himalayas; the Black Forest of Germany where my biological father was from; Switzerland where my biological mother is from;, Innsbruck, Austria which is gorgeous and quaint; Lake Como in Italy; coastal areas of France; London and Liverpool where the Beatles are from, or the Giza Lines in Peru. Those are all on my Bucket List, and some other places, but I doubt in this lifetime I will be able to visit them all, if even one of them. And I love the Ocean too. I grew up in New Orleans and the Gulf in Mississpi was our backyard, our playgroud and we went to Florida at least three to four times a year, the regular hot spots like Pensicola, Navarre Beach, Miami, etc. I have been to Mexcio, Guatamal, and Nassau, Bahamas. Then on my foster father’s side, twice a year we’d go up to the coastal North Carolina where he grew up as a boy in a home across the street from the Atlantic Ocean, so, those memories are equally special. I love water and I miss it, for Colorado is mostly mountains and desert and bodies of water, unless you get more northern where there are beautiul lakes up in the mountains, I don’t get to see it that much. I live without walking distance of a 100-acre Reservoir but it’s not the same. Thank you both for your endless support, it means a lot to me. I hope I do as much for the both of you as you have unconditionally done for me.